Building on the success of last year’s winter course over 250 people attended this year. The main hall at the Spectrum Leisure Centre in Guildford was full. As in previous years the Chief Instructor of the Wado Academy M. Shiomitsu 9th Dan Hanshi Shihan extended an invite to the 3rd Grand Master of Wado Ryu Karate-Do H. Otsuka III Sandaime Soke to teach on the course. The Grand Master along with A. Meek 7th Dan Renshi and P. Hill 7th Dan Sensei took the students through the principles of Wado Ryu and its philosophy. On the first day of the course our Chief Instructor confirmed the appointment of A. Meek Renshi as the Academy’s Assistant Chief Instructor. o Ryu family. He stressed that it was perfectly acceptable to practice either version or both. The key point was that every care should be taken by students not to mix the two up when practising this kata. Each day of the course started with the traditional period of mokuso, followed by a warm up, which was vital for those who were not use to 20 minutes of kneeling meditation. Mokuso certainly tests the will and for those who practice meditation regularly it gives them the opportunity to breath correctly and focus the mind. With the opportunity to practice techniques that demonstrated these principles. After a break the class was broken down into different groups by grade and each instructor taught some aspect of the Wado Academy syllabus, including the Dan grade syllabus. 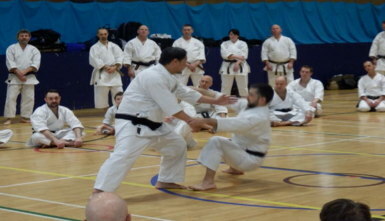 For two days during his sessions the Grand Master taught both versions of Niseishi kata and demonstrated the application of the different techniques. Naturally, it goes without saying that Shiomitsu Sensei visited the course every day and took a keen interest in what was being taught; the standards of those taking part and the general demeanour of the students and their attitude to training all of which are very important to him. Shiomitsu Sensei still expects and demands from everyone high standards in all aspects of training and personal behaviour. On the Saturday evening a party was held in honour of the 3rd Grand Master’s visit and it allowed Wado Academy students to renew friendships and discuss Wado Ryu Karate-Do. This year students came from the following countries: Australia, Belgium, England, France, Finland, Germany, Hungary, Italy, Japan, The Netherlands, Norway, Portugal, Scotland, Sweden, Switzerland and the United States. On the final day of the course a Dan grading was held. The Dan Grading Panel consisted of: The Grand Master, The Wado Academy Assistant Chief Instructor, Tran Heiu Minh 7th Dan Renshi, N. Quillam 7th Dan Sensei, P. Hill 7th Dan Sensei, R. Howells MBE 7th Dan Sensei. All the students who took the grading are to be commended for their efforts and the following are to be congratulated on passing their grading. Finally, a big thank you must be given to Mrs Maya Shiomitsu and Ms Akiyo Shiomitsu for their very able administration for such a large course. Their attention to detail meant that the course ran smoothly and that everyone went away having been able to think about Wado Ryu Karate-Do and practice many of its subtle techniques.